Still sticking to my book buying ban, and the book I got from the library was one that was on hold. So I'm still doing good! I couldn't resist the Galley Grab books though. BLOOD RED ROAD!! American Red Cross Donation Page. You can also donate to the Red Cross Disaster Relief by texting REDCROSS to 90999 to give $10 to help our disaster relief activities across U.S. Thank you!! 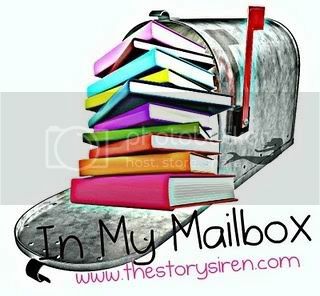 So what's in your mailbox this week?? Leave a comment with you link so I can check out your awesome posts! I got my Simon Galley Grab newsletter yesterday too, but couldn't find any that I really wanted to read. Oh well. Still have today to do some book shopping! I always forget to put what I download from S&S Galley Grab and Netgalley. you've got so many great books this week! happy reading! I read Forbidden close to a year ago. The writing is great, but it will mess with your mind. You go into it with your views on what's right and wrong and she just turns them around. I still think about it to this day. Can't wait to see what you think about it. Glad you're OK. It's scary to think that things like this are happening more and more frequently. Galley Grab had some totally awesome books this month! I can't wait to start reading them. I haven't picked out all the ones that I plan on getting just yet :) Happy reading! Galley Grab!! 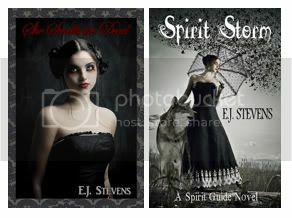 <3 I can't wait to read Blood Red Road as well! And He's So Not Worth It!! The storms are just devastating. Glad you're all right though! I also got Blood Red Road and am so excited to read it! Looking forward to your thoughts on that and Something Like Fate. I love the sound of all the books you've received :D Hope you enjoy them! I can't wait to read Something Like Fate so I look forward to read your review ! Forbidden is an awesome book, probably one of my favorites books. It's such a moving book !! I'm sure you'll love it ! LOVE Galley Grab! Hope you like everything! Great books this week. I got a lot of the same book from the S&S GG. Not Blood Red Road though - maybe I should go download it. Great books! I can't wait to read Blood Red Road and The Day Before. I didn't know you lived down that way. I'm glad you are okay. Yes, the devastation is awful! I can't believe how big the tornado was. Great mailbox this week! You've got a lot of cool books! I love the cover for She Smells the Dead, it's creepy and mysterious, yet engaging. hi christy! awesome books this week. i can't wait to hear your thoughts especially about blood red road. i really want to read that. Hello! 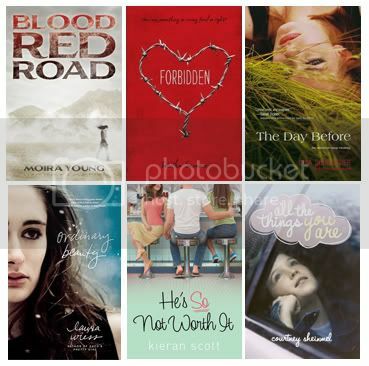 My name is Angie and I am a fellow member at Chicks on Lit on goodreads! Thought I would stop by and say HI! I'm dying to read Ordinary Beauty, but I didn't get last GalleyGrab newsletter... so jealous!